After the massive success of JioPhone in the country by selling 25 million units, Reliance Jio in its Annual General Meeting announced that it would be launching a new JioPhone 2 device and the sales would start on August 15 – Independence Day. The JioPhone 2 does not differ from its predecessor a lot apart from its pricing and design. Reliance Jio has accumulated some high expectations from the new JioPhone and claims that it might be an even more significant success than the previous device. 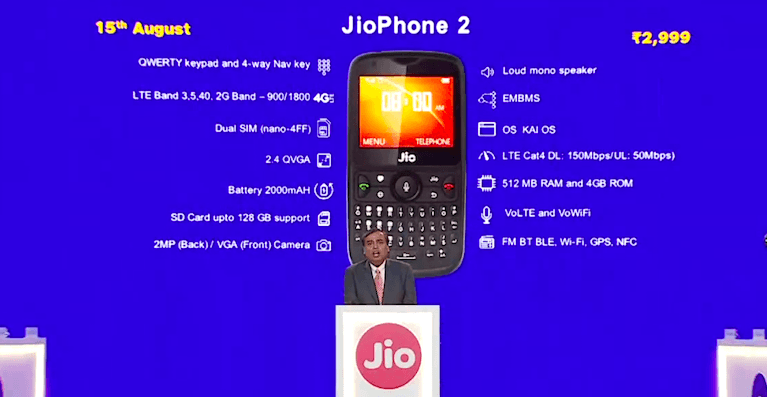 The JioPhone 2 will be available on MyJio application and Jio’s official website. Read further to know more about this new phone along with its specifications and special offers. To get your hands on the new JioPhone 2, you’d have to head over to the MyJio App or visit jio.com; you’ll then have to navigate towards the registrations for the device and then tap on ‘Get Now’ option. You’ll be asked to enter your details along with the shipping address and other information. Now you will have to make the payment of Rs. 2,999 via net banking or debit/credit cards. Your booking will be done once you complete the payment procedure. The device will be delivered to your entered address in a few days’ time. The registrations for the JioPhone 2 will go live on August 15. The first thing that buyers will get to notice about the new JioPhone 2 is its uncanny resemblance with the BlackBerry phones owing to their QWERTY keypad design. The screen on this device is a 2.4-inch sized display with QVGA resolution. Speaking of performance, the processor on the phone is the Spreadtrum 9820 dual-core SoC which clocks a frequency of 1.2 GHz. The RAM on this device is 512MB, and it comes with 4GB of onboard storage. However, there is the option of sliding in a microSD card, in case you feel the need. As for the software, the new JioPhone comes with KaiOS like its predecessor, and it will support popular apps like WhatsApp, Facebook, and YouTube. The camera setup on the rear is a 2MP sensor, and there is a VGA camera on the front. The device comes with a 2,000mAh battery and claims a battery life of 14 hours. Connectivity options on the phone include Wi-Fi, GPS, NFC, Bluetooth, FM radio, VoLTE, and VoWiFi. The device also allows a max download speed of 150 Mbps and upload speeds of up to 50 Mbps thanks to the LTE Cat 4 support. The phone will only debut in a single standard black colour, and it will bear a price tag of Rs 2,999. Interested buyers will be eligible to buy the original JioPhone at the effective price of Rs 501 under the Monsoon Hungama Offer. To reap the benefits of this plan, buyers will only have to exchange their old feature phone along with its charger to the retailer. Following the exchange of the old phone, which should be working in order to be eligible for the exchange, the purchaser will then have to pay Rs 501 security deposit. The security deposit, however, will be refundable to the user after the completion of three years. Additionally, buyers will get a new Jio SIM with the device to which they can decide to port their old number using mobile portability. Apart from this, the new users of JioPhone will also have to shell out Rs 594 in addition to the security deposit for a six-monthly recharge. This plan by Jio will get them calling and data benefits on JioPhone for six months straight. Neither of them. People say Oppo Real me 1 but I doubt about it. Kaushik IMA,your views,what about Oppo F7/Realme 1. Honor 7X at 10999 is great option in my opinion. Honor play supports 3CA. None of the phones you have CA it seems. Not interested in Crap jio 2 phone but what about registration / installation of jio giga fibre & how long will it take ?